Does yourlittle one love escaping from their carseat, highchair or stroller harness? Dangerous isn't it! Does it drive you insane? Well here is your solution!! What is the Houdini Stop? The Houdini Stop Chest Strap is a device which prevents your child from taking their arms out of their car seat straps. It consists of two simple clips joined by a length of material. The clips connect to each of the 2 car seat straps and hold them closer together preventing your child from wriggling out. What size Harness does it fit? Yes. The Houdini Stop has been officially crashed tested & reviewed by ACRI. Check my site side buttons to read the great results.The Houdini Stop is legally allowed to be purchased as an accessory, and used on a wide range of harnesses. It is a aftermarket product, therefore a parent or caregiver can decide whether or not they would like to use it with their child. Can it be used in replacement for an exisiting chest clip? Will it work for my Houdini? It should do....The Houdini Stop, has more than a 95% percent success rate. Most young children are not dexterious enough, or strong enough in their pincher grip to work the release mechanism. The Houdini Stop can not be made 100% inescapable, as an adult needs to be able to easily work the release in an emergency situation. 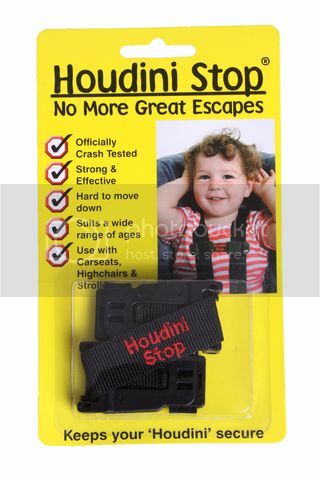 Most children actually begin to love having a Houdini stop and I have heard many stories about children insisting that their Houdini Stop must be put on.